Looking for the world’s most expensive afternoon tea? Go to Berkshire! 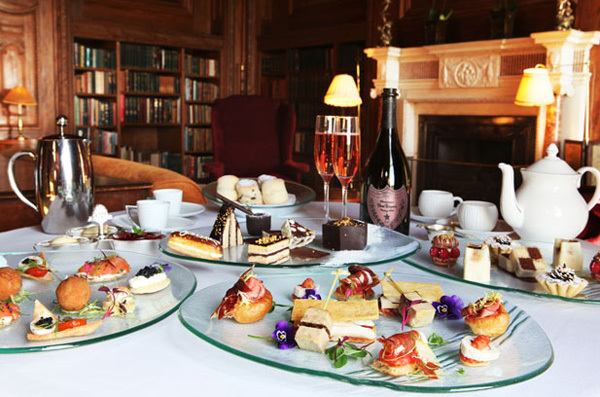 Part of the von Essen hotel group – The Cliveden House in Berkshire is offering the world’s most expensive afternoon tea – which carries a price tag of £550 ($900) per couple. Executive head chef Carlos Martinez has devised the afternoon tea, available for two people. This tea includes white truffles at a £2,500 per kilogram, Beluga Caviar at a massive £4,000 per kilogram and Da Hong Pao Tea, which is harvested from one thousand year old plants and is so rare that it costs over £2,000 per kilogram. The afternoon tea is followed by a glass of Dom Perignon Rose, described as the ‘King of Champagnes’. For this price, the afternoon tea contains the ‘Cliveden House Chocolate Cake with Gold Leaf’, which uses the most expensive chocolate in the world, Amedi Porcelana. This luxurious cake, must be matched with appropriate, the most expensive coffee in the world, Kopi Luwak. This unique coffee is so rare that it costs an incredible £50 per cup. Von Essen’s previous ‘world’s most expensive…’ title had the hotel’s Platinum Club Sandwich which priced at £100 and now is also part of the menu. It comes in a mini canape version and is made from 30-month air-cured Iberico ham, described by the Spanish as the ‘fourth gastronomic wonder of the world’, poulet de Bresse, white truffles, quail eggs, semi-dried Italian tomatoes and 24-hour fermented sour dough bread. James Parkinson, executive head chef at von Essen hotels group, said: All hotels in the collection, including Cliveden, are hugely popular for afternoon tea. We wanted to create the best afternoon tea experience in the world and I think with this selection, we have achieved our goal. Cliveden will also be donating 50% of any profit to Marie Curie Cancer Care from each of the ‘World’s Most Expensive’ afternoon teas sold between June 12th and July 12th 2011.